Datsun GO has received an update after a gap of four years. Changes to the hatchback have been made on the cosmetic front and it gets additional features that make it a better package altogether. In addition, the car maker has added new colour options to the carline. Styling changes have been made to the five-seat layout cabin; it now comes layered with a premium instrument cluster, sporty bolster cushioning and a host of other bits. Packed with the above changes, the Datsun GO price in India is pegged competitively. View offers on Datsun Cars from Datsun dealers in Hyderabad at Autozhop. Unlike the exterior, the interiors are brand new. While the overall plastic quality is only slightly better, there is an all-new, all-black dashboard which gets a much cleaner layout. The centre AC vent design has been changed as well and they are now a part of the the top layer of the dashboard. The non-adjustable steering wheel is the same unit as before but now comes in black. There is a brushed aluminium-like plastic cladding, which makes it look more premium. There are no buttons for audio or phone calls here, a feature which would have been a definite value addition. The instrument cluster is now borrowed from the Micra. When compared to the outgoing models, the new version gets an analog tachometer on the left. The small orange backlit MID (multi-info display) at the bottom displays the odometer, trip metre, distance-to-empty, time and fuel level. Strangely, there is no lane change indicator, which is a very basic yet useful feature. The biggest change here has to be the centre console, which now features a 7-inch touchscreen infotainment system. This system is responsive to use and features crisp graphics for menus. It also supports Android Auto and Apple CarPlay connectivity apart from the usual USB, Bluetooth and Aux inputs. Datsun will also offer a rear parking camera as an accessory, which sends the video feed to this screen. Sadly, the disappointing audio quality from the two-speaker setup takes away from the experience a bit. Below the touchscreen are knobs for the manual AC. The USB and AUX-in ports are placed a bit oddly on the panel below the gear shifter, away from the line of sight. Speaking of seats, Datsun has reworked them and they are now called ‘Anti-Fatigue Seats’ These feel well cushioned and supports your backs even on longer journeys. However, there is no height adjustment for the driver’s seat, while the steering wheel continues to be non adjustable. This can make finding a comfortable driving position a bit tricky. Nevertheless, you now get electrically adjustable ORVMs, which is an added convenience. Although the rear seat offers adequate headroom and legroom, you sit a bit low with the knees pointing upwards, which gives you the impression that the seats lack under-thigh support. Shoulder room feels wider than cars in its category and is just enough to squeeze three average-sized adults, albeit for shorter journeys. Sadly, there are a few things missing here as well, including adjustable headrests, rear centre armrest and lack of storage options as you only have one centre bottle holder and seat back pockets.At 265 litres, boot space in the GO remains the same as before and is enough to accommodate the family’s weekend luggage. The Datsun GO is powered by the same engine as before i.e. the 1.2-litre, 3-cylinder petrol unit which produces 68PS and 104Nm of torque. However, Datsun’s engineers have made revisions to the gear ratios of the 5-speed manual box, which could have been done to manage the higher kerb weight. As a result, the car still feels peppy, with the engine pulling strongly from 2000rpm onwards. Datsun claims the GO can complete the 0-100kmph run in just 13.3 seconds. Rest assured, we’ll soon put the car through a thorough road test and verify these figures. Apply car loan for Datsun GO in Fincarz. Mechanically, the GO is rather sorted. The tyres are thin and tiny (13 inches) and the car does exhibit substantial body-roll. The GO should come with a sticker – “Statutory Warning: Don’t drive like a lunatic; this car has a tendency to tip over on one side”. But if you know what you’re doing, it can be quite a playful thing too! The steering feels detached and lacks any real feel. The chassis feels very balanced though, and the GO would make for an exciting car if fitted with larger wheels and wider, better tyres. The ride quality is extremely good and the suspension doesn’t go into trauma even when going over large potholes – a big annoyance with the Eon and Alto. The Datsun GO does give you that big-car feel which others in the segment don’t and that in itself is quite an achievement. Datsun Go On-Road Price in New Delhi ranges from 3,78,162 to 5,00,114 for variants Go D and Go T Optional respectively. 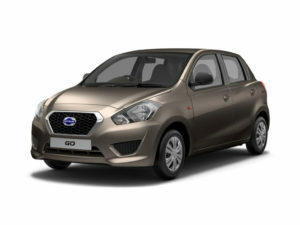 Datsun Go is available in 5 variants and 6 colours. Below are details of Datsun Go variants price in New Delhi. Check for GO price in New Delhi at Tryaldrive.